In 2014 the NTZ decided to undertake an innovative, experimental pilot project for school children to “re-discover their living traditions and identify their cultural roots”. The project focused on heritage education management and based on community participation in terms of their time and materials and provided capacity building for school teachers. A copy of “The Heritage Education Toolkit” used by heritage clubs in secondary schools was kindly given to the NTZ by the Cross Cultural Foundation of Uganda. The project was drawn up following the guidelines from Uganda, but adapting the details to the Zimbabwean context. The project was championed by Mrs Edone Ann Logan Chairperson of the Rhodes Nyanga Historical Exhibition (RNHE). 132 children and 6 teachers, from a secondary school and 2 primary schools, each of which run a Heritage Club, were involved in the project which was the recipient of an International National Trust Organisation (INTO) Small Grants Programme (SGP) fund for which the NTZ was truly appreciative. The SGP is designed to provide small scale but catalytic support for the international family of INTO member organizations, working on heritage management and related community-led cultural programs. The primary purpose of the SGP is to build capacity and strengthen governance, membership recruitment and sustainability of INTO members. The Project gave the RNHE and the NTZ the opportunity of raising public awareness to the value of cultural heritage and the study of the unique prehistory of the area was incorporated into the history and heritage curriculums. Training guides for the schools involved in the programme were compiled and a display of items/pictures and artifacts took place at the RNHE. The NTZ now has a proven blueprint for cultural heritage education management that can be replicated in other schools countrywide. We have seen that schools are keen to encourage the pupils to take an active part in Museum research and displays. We encouraged schools to visit heritage sites in the area and experience hands-on traditional crafts, and most importantly, research their own family histories, collect stories from their grandparents, and find their own identities within their ethnic groups. We would like to thank Mr W Dhlandhlara of the SOLON Foundation who supported the project and very generously provided funds for the transportation of the school children to the activities and funding the final traditional meal. SOLON also provided each school in the area (60) with a copy of Robert Soper’s ”Terrace Builders of Nyanga”, and the Prehistory Society of Zimbabwe followed by donating Rob Burrett’s “Shadows of our Ancestors” to each school. 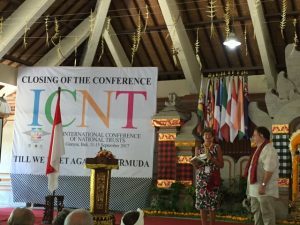 The 17th International Conference of National Trust (ICNT) was recently held in Bali and the opportunity to celebrate and review the impact of the INTO SGP was undertaken. As a past recipient of the SPG we were invited to submit our project into the SGP competition. Our entry was displayed at the SGP Success Booth set up at the conference to show each project and request each visitor to the Booth to rate the “”Best SGP-supported Project”” from among all previous winners over the past 3 years, rating the Best with a single token vote. 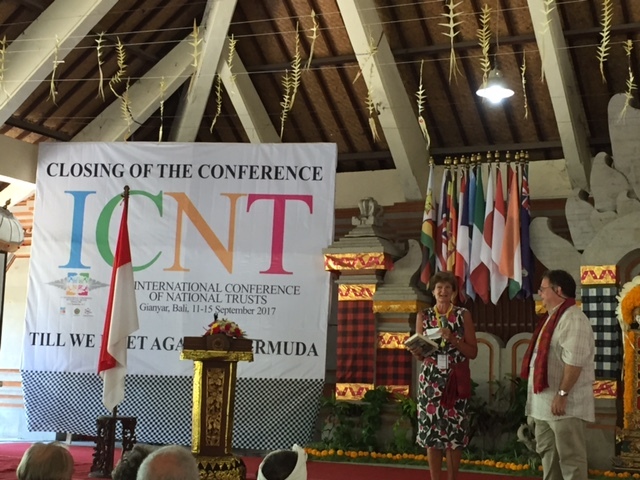 On the final day of the conference (Friday, 15 September 2017) Dame Fiona Reynolds, the INTO Chairman, announced that the NTZ had won the competition! With over 130 delegates from 30 countries at the conference, including three Executive Council members from the NTZ, we were very proud and excited to have showcased the work that we do in Zimbabwe on a global platform. Congratulation’s go to Edone Ann Logan and to all her committee members for implementing the project.